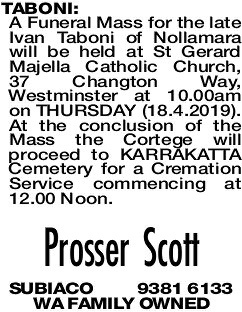 A Funeral Mass for the late Ivan Taboni of Nollamara will be held at St Gerard Majella Catholic Church, 37 Changton Way, Westminster at 10.00am on THURSDAY (18.4.2019). At the conclusion of the Mass the Cortege will proceed to KARRAKATTA Cemetery for a Cremation Service commencing at 12.00 Noon. Dearly loved Father of Joseph, Grandfather of Joshua. Youngest Son of George and Ivy, Brother of Phyllis, Thelma and Vernon (all dec) and Zina, and loved Uncle of many. 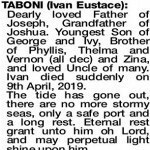 Ivan died suddenly on 9th April, 2019. The tide has gone out, there are no more stormy seas, only a safe port and a long rest. 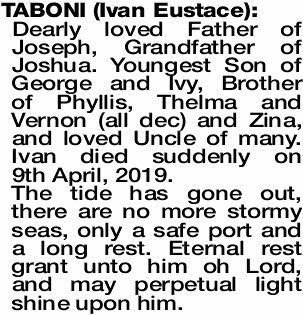 Eternal rest grant unto him oh Lord, and may perpetual light shine upon him. 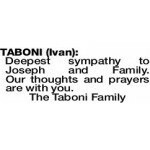 Deepest sympathy to Joseph and Family. Our thoughts and prayers are with you.